Our tailored navy jumpsuit is the perfect blend of glam and power suit! Runs TTS and has slight stretch. Shine bright you crazy diamond, you! This is a cropped metallic knit jumpsuit perfect for your next night out! Add a belt and your fave faux fur jacket to top off this gorgeous piece! 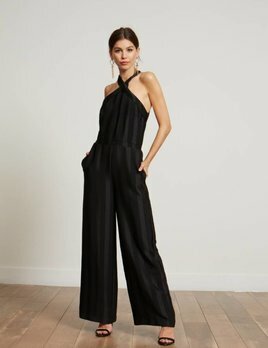 Channel your inner Parisian with this show stopping jumpsuit!